Basswood: Carving wood,craftwood,and great for chipcarving. Basswood is more commonly referred to as "American Whitewood" in the lumber industry, it is often confused with other whitewoods like poplar and various components of the tulipwood family. In the landscaping industry, the sales staff would refer to it as an American linden, or lime tree. It grows most commonly in the eastern, central part of North America, particularly around the great lakes. There are approximately 30 different types of basswood in this part of the world. The young basswood trees have smooth gray bark, that darkens and becomes deeply ridged as it ages. It is a fast growing tree that loves to grow along the sides of rivers. Trees can easily grow 80' tall and more than 2' in diameter. The bark was boiled to make a treatment for burns. Basswood is most notable as a wood for carving, particularly because it is commonly found in thicknesses of up to 4". Chip carvers use it extensively in basswood boxes, trays, and clock faces. A lot of my folk art customers are equally excited about basswood as a craft & hobby wood for their painted projects. It is frequently used for food containers because it imparts no odor or taste onto the finished product. Basswood has been used for musical instruments, matches and blind slats. In our area, it is chipped extensively for pulpwood, in fact we have to fight with the paper makers to get enough logs to use for all our paint grade trim and planks. Often, basswood is used for box making, and then covered with exotic veneers. Its dimensional stability shines in these applications. Basswood is not a very exciting wood species to look at, with little grain and mostly pure white in colour, but it's wonderful carving characteristics put it ahead of the class as a carving wood for use in intricate projects. 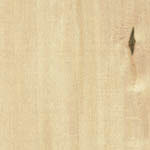 It is a very soft wood, similar to eastern white pine, but without the strong grain structure. It does not bend well, but does dry easily with little downgrade. It does shrink alot on drying though, but remains stable afterwards . Heart stock can show brown streaks and/or thin black seam lines, both of which paint over easily if used in paint grade projects. The wood has no taste, and a slight sweet grass smell when cutting. Basswood is a great wood to paint. It has very little sap and/or pith pockets that are common in pine, so it is not necessary to seal with oil based primers. It finishes easily with latex paints. Basswood can be stained but shows little grain pattern. The stain can blotch, so try a test piece first to see if you can get your desired results. A wood conditioner used in advance of the stain will encourage more uniform absorption. It takes a polyurethane finish beautifully. Basswood is extremely easy to cut with both hand and machine tools. It carves very easily both with and across the grain. It does tend to burn, if your router bits are dull or you move too slowly, but the marks do sand off fairly easily. It is "kind" to all cutting edges and can be nailed without predrilling. It has enough structural integrity to allow for intricate designs and is very dimensionally stable so it holds its shape. It turns easily, but you must work your way down the sand paper grit line to effectively eliminate the scratches. It glues well.